When I recently told my best friend that I was excited to be going "birding," she couldn’t stop laughing. I had to explain to her that I hadn’t randomly turned the noun "bird” into a verb, but that I was just reducing the shortened term "birdwatching" to a simple, two syllable, how-else-would-one-spend-a-Saturday, catchy "birding." Here are my top tips on how you can walk the walk, and flap your wings, like a true birder. To get started, you only need your ears and eyes. But if you want to take things up a notch, add a pair of binoculars (referred to in birding lingo as “binos” or “bins”). Bins: Binoculars are great for helping you locate birds hiding among foliage, high up in treetops or floating downriver. They also allow you to study these creatures from afar without disturbing them. Top-of-the-line models run from $500 up into the thousands of dollars range, but a reasonable pair can be picked up for $100 to $300. Smaller, more compact binoculars can be easily grabbed at a local sporting goods store for under $30. Neck straps or harness: If your bins are heavy, try a neck strap, or a harness that wraps around your back and disperses the weight across your upper body. My neck always thanks me at the end of the day, as dorky as I may look. 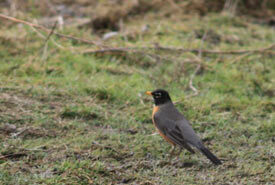 Bird ID resource: Field guide or birding apps help you zero in on the species just spotted. Sound recorder: A sound recording device (most smartphones have this capability) can be helpful once you’re back at home to narrow down what bird was singing. Did you know that every bird has a distinct song? I was always aware of the vague music of birds singing in the background, but now that I’m a birder I can't stop trying to name their songs! ebird: This site compiles reports from other birders to get an idea of what species are present in your area at what time of year. 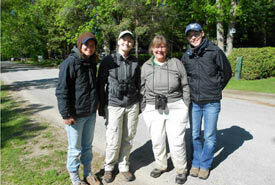 Cornell’s online lab of ornithology: A great resource for birders of all levels. 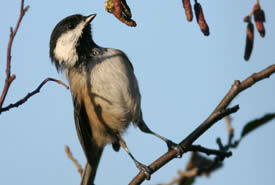 You can listen to different bird songs to narrow down what you heard – was your bird trilling? Did it have a complicated song? A series of short notes? When I first started birding, I had a CD of bird calls I'd play in my car while I drove. It would play a call, give you a moment to guess, then identify the species for you, often giving helpful mnemonic devices to help you remember it later (chickadee mating song sounds like a high-pitched "cheeeeeese-bur-ger!"). Like any favourite album, much of this CD is now deeply embedded in my memory and I can sing along pretty well. If you prefer using your eyes, look for movement, shadows, rustling in leaves, and try to catch that bird in your sight. You may not right away be able to say, "That’s a black-throated green warbler!" However, if you make a note that you saw a small yellow-green bird, with a black throat and white bars on its wings, you’ll be that much closer to figuring out what you spotted when you’re browsing online resources or a field guide (I’m pretty old school myself and love using The Sibley Guide to Birds). Now that you have an idea of how to equip yourself and some handy resources, you're ready to head out (or stay in your backyard or neighbourhood) for a birding adventure, which I will outline in Part Two of this blog. In the meantime, happy birding! 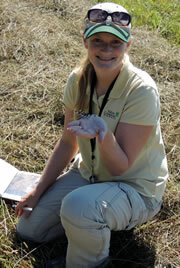 Kristyn Ferguson is NCC's program director for Central Ontario – West. Read more about Kristyn Ferguson.